The Navy zeppelin USS Macon was lost off the coast of California in heavy winds on February 12, 1935. This enormous airship was four times the length of a modern Goodyear blimp, and carried 100 crewmembers. More remarkably, the Macon was a "flying aircraft carrier" able to launch and retrieve reconnaissance airplanes in flight. On September 17th of this year, Stanford engineers joined an expedition from the Monterey Bay Aquarium Research Institute (MBARI) to explore the wreck. Deep-diving remotely operated vehicles (ROVs) with cameras were used to take more than 14,000 pictures detailing the crash site, which is now spread over 75,000 square feet of ocean floor. Over the next few months, these images will be combined and color corrected to form a complete image of the wreckage of this unique aviation experiment. Built by the Goodyear-Zeppelin company in the early thirties, the Macon and its sister ship the Akron were constructed with rigid hulls of aluminum alloy. The ships were kept aloft by 12 helium-filled cells inside the hull; 6.5 million cubic feet of helium were used. 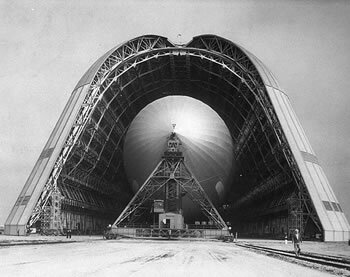 Each airship was 785 feet long with a special internal hangars located about two-thirds of the way behind the nose of the airship, housing five light Sparrowhawk aircraft. The Macon and the Akron were able to launch and recover the planes using a T-shaped opening in the floor of the hangar. A welded metal "sky hook" was attached to the top of each plane; the hook attached the plane to a trapeze. The trapeze with its attached plane was lowered through the hangar floor. Pilots revved their engines, yanked a release lever, and dropped into the air. The retrieval process was a bit trickier. 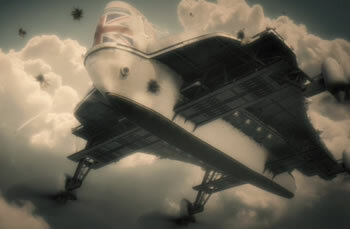 Piolots had to match speed with the rigid airship, and guide the hook back onto the trapeze. The whole assembly was then lifted back into the body of the airship. The airships used eight Maybach 560-horsepower gasoline reversible engines to drive outboard propellers; speeds of up to eighty miles per hour were possible. The photographic expedition by Stanford and MBARI will provide a fitting tribute and ending to the real-life airship Macon, whose great size and rumbling engines were a familiar part of life to students at Stanford in the early 'thirties.